It was about a month ago that my good friend Jenn tweeted at me after eating at a local restaurant not far from where she works. The main thing…crepes. The bigger deal was…gluten-free options. I told her that when I came to visit in a couple of weeks, that was a requirement. She agreed. And we held each other to our word. 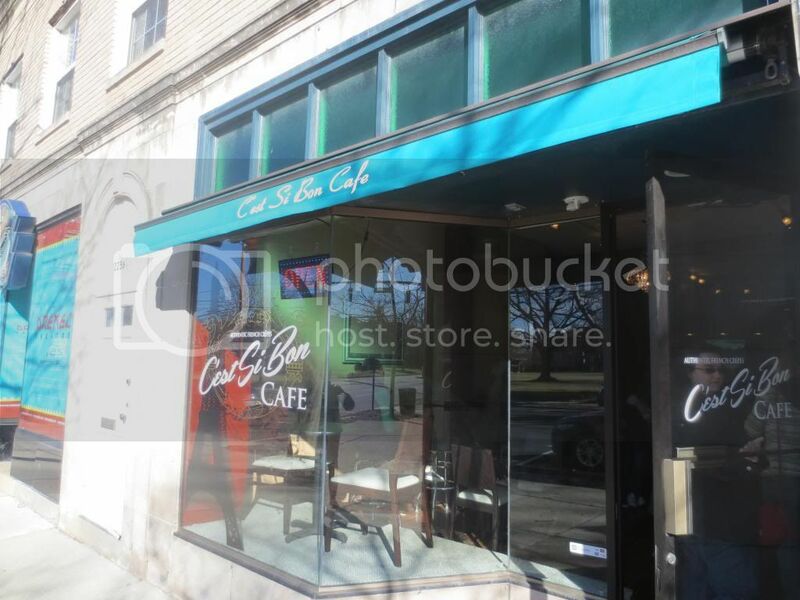 On Saturday morning, after snagging coffee, we headed out to Bexley…and there…not far from my favorite Columbus gluten-free bakery (Cherbourg Bakery), was C’est Si Bon Café. It is a small, quaint, unassuming place. Not very many tables, and a little bar that runs along the side wall for customers to sit and eat. It was bustling that morning and we were grateful to find a place to settle in…stealing a chair from the table in the window so three of us could sit at the table. I held our spot while Jenn and Cathy went to order. They went for traditional breakfast crepes, each of them getting a Bacon, Egg and Cheese Crepe ($5.95). As for me, I wanted something sweet. I opted for the Gluten-Free Cinnamon and Sugar Crepe ($6.00). Gluten-free crepes are a $1.25 upcharge there, so that’s why mine seems so pricey for such a simple crepe. A regular version of the same crepe runs $4.75. Just an FYI. It took about 10 minutes for our orders to be filled. No problem on the wait…since they make everything to order. And, mine was a specialty one…being gluten-free and all, so that was important too. They do have a separate crepe stone for the gluten-free crepe orders and the crepes are made from buckwheat flour. When the order was up…I was so happy. My local gluten-free crepe truck is out of the state for the winter and won’t be back until April. Therefore, I have been crepe-less since the end of fall. This felt like such a treat because I hadn’t had a crepe in so long. My crepe was stunning and huge. It looked really good. 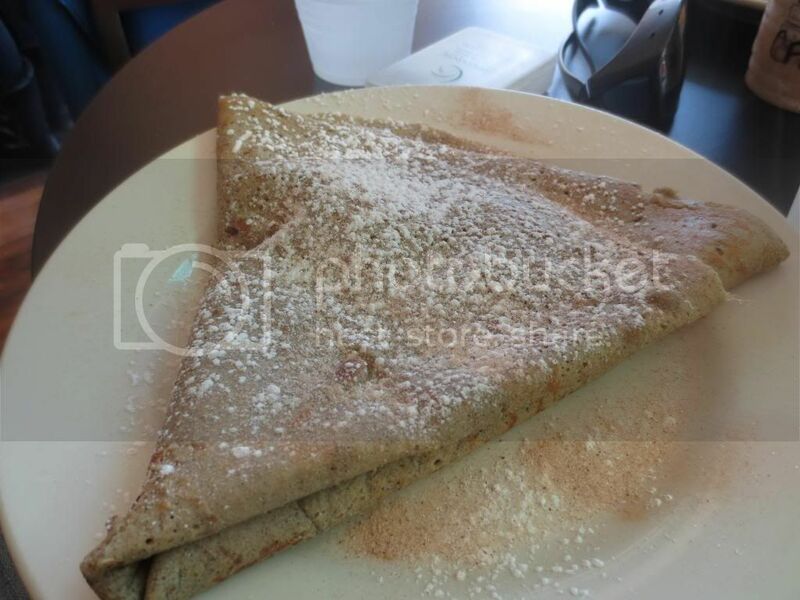 As stated above, the Gluten-Free Cinnamon and Sugar Crepe is made from buckwheat flour. Folded into it is butter, sugar and cinnamon. Simple. Easy. And I was betting tasted a lot like French Toast. And I love French Toast. So this was bound to be the best of both worlds. I wasn’t disappointed. One bite of the folded, light, crepe and I was in heaven. The sugar and butter gave it this toasty feel…and the cinnamon brought a bit of spice. It was just what I wanted. It was what I really, really wanted. The crepe itself might seem so basic, but the flavors were fantastic. I gave a piece to both Jenn and Cathy and both agreed it was like eating French toast. Count me as one very happy girl. I’ve already said that C’est Si Bon Café is a must now every time we’re in town. I mean…the menu is extensive and there are both sweet and savory ones that are just begging for me to try them. I already know what flavor I’m going to get next time. Just going to work my way through the ones that interest me greatly. C’est Si Bon Café definitely is a place that everyone needs to try out. Honestly, I was so impressed, not just with the care and service, but the crepes themselves were OUTSTANDING!! I am one happy crepe-loving gluten-free girl. And I’m already trying to plot a return to the Columbus, Ohio area to visit Jenn and come try out another fantastic crepe creation. You’ll want to. Trust me. This entry was posted in Breakfast, Dessert, Entree, Food, Gluten-Free, Local, Pancakes, Restaurants, Review, Sweet Stuff, Travel, Vegetarian by The Celiathlete. Bookmark the permalink.